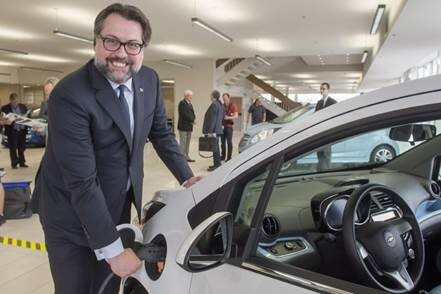 The Minister of Sustainable Development, Environment and the Fight Against Climate Change, Mr. David Heurtel submitted yesterday to the National Assembly a bill to allow the Quebec government to require auto manufacturers to sale or rent a minimum of zero emission vehicles (ZEV) through a system of tradable credits. With this bill, the Government would stimulate the supply of ZEVs to allow Quebec consumers to access a wider range of plug-in vehicles meeting their needs. Following its adoption by the members of the National Assembly, the bill will be followed by a zero emission regulations aimed at auto manufacturers. According to the measures proposed in the bill, a car manufacturer would have to meet a sales target of ZEVs transposed in credits and determined by the government, starting from the year 2018. This target would be calculated by applying a percentage to the total number of light vehicles that each manufacturer sells in Quebec. Although being intermediaries between consumers and car manufacturers, car dealers would not be directly affected by the law. Electric Mobility Canada wants to be part of the consultation process on this legislation in order to develop a balanced legislation, taking into account the successful conditions to increase EV sales. These conditions include the pursuit of measures supporting the increase of demand as a top priority as well as the supply of vehicles. See our document: Electric Mobility Canada’s Supply and demand policy.